Chastain provided Phase II design and Phase III construction engineering services for the resurfacing of existing pavements, traffic signal and lighting LED upgrades, and ancillary improvements to address conditions of fencing, guardrail and drainage elements for both the north and south I-390 frontage roads between Wright Blvd. and Springinsguth Rd. The goal of the project was to help facilitate the jurisdictional transfer of the frontage roads from IDOT and the Illinois Tollway to the village. The frontage roads were classified as local streets and are expected to see an increase in heavy truck traffic with recent improvements to I-390. The project consisted of milling 5-inches of traditional HMA surface and binder mix and resurfacing the existing pavement with a 5-inch overlay of leveling binder and SMA mix to improve structural pavement values. Scope of work also included modifying six existing traffic signals to accommodate LED fixtures and new controller components, and design of existing street lighting conversion to LED fixtures on separated systems for village ownership. 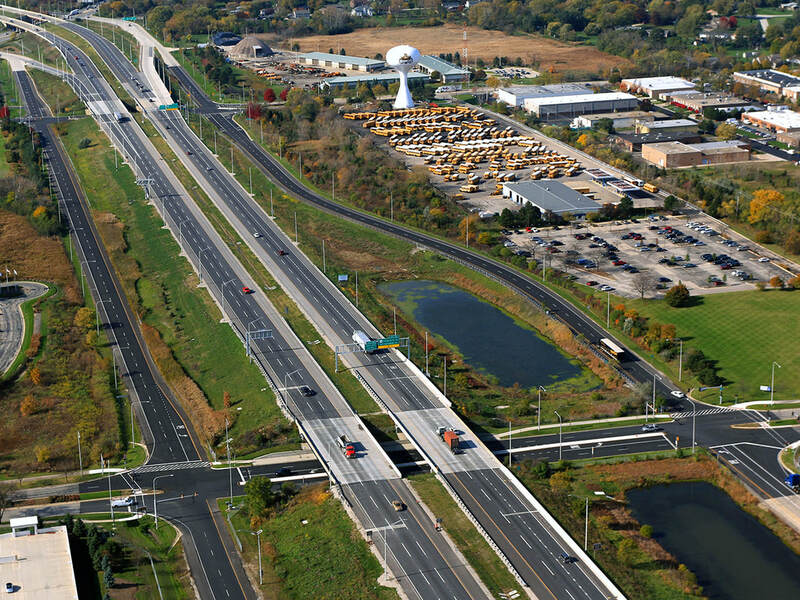 Services included project management, existing condition field verification, supplemental survey, pavement design, construction document preparation, and IDOT and Illinois Tollway coordination. This was a fast-track project completed in 2 1/2 months including coordination with the state agencies to facilitate construction. The project was locally funded with reimbursement from the Illinois Tollway. Construction cost was $2.2 million.